SACRAMENTO, Calif. (AP) -- California Gov. Jerry Brown has rejected parole for a man convicted of gunning down a San Diego police officer in 1978 when he was a 17-year-old gang member. Brown's decision late Friday rejected the recommendation in August of a state parole board, which called for the release of Jesus Cecena. Brown says he acknowledges Cecena was a minor when the crime was committed and that he has worked to improve himself while in prison. But Brown says the seriousness of the crime combined with Cecena's minimizing of it forces him to refuse. Brown reversed a previous parole recommendation for Cecena in 2014. Cecena was tried as an adult and sentenced to life in prison without the possibility of parole for shooting 30-year-old Officer Archie Buggs four times during a vehicle stop in November 1978. The term was later modified, giving him a chance at parole. "This is a victory for justice! Justice for fallen officer Archie Buggs, his family and law enforcement officers serving the great state of California. The executioner, Jesus Cecena was rightfully sentenced to spend the rest of his life in jail for the murder of officer Buggs. Our association expresses thanks to Governor Brown for ensuring Mr. Cecena remains in prison. We also appreciate the effort put forward by San Diego Police Department Chief Shelley Zimmerman, District Attorney Bonnie Dumanis, California Assembly Speaker Toni Atkins, public safety associations and leaders, elected officials, community leaders, organizations, and too many individuals to list who were willing to take a stand in opposition to granting Mr. Cecena parole. "Sadly, the California Department of Corrections Board of Parole Hearings is more concerned with emptying prisons. The magnitude of the crime, and the devastation it inflicted on Officer Buggs’ family appear to be just footnotes in a move designed to free up a prison bed. The murdering of a law enforcement officer is not just the killing of an individual, they are attacks on the very foundation of society. 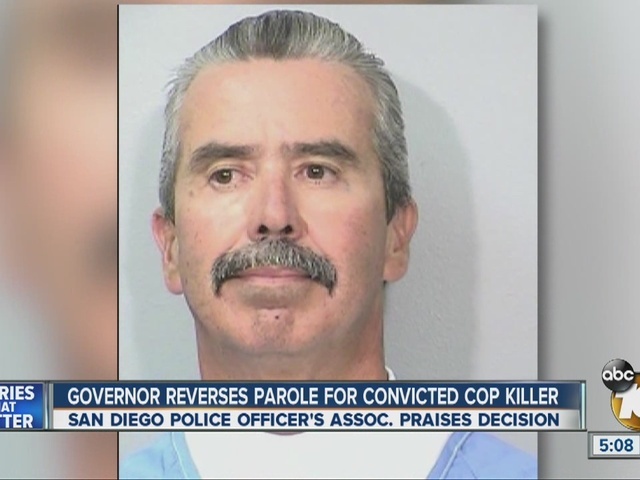 "We hope in 2016 the California legislature and the Attorney General will address this serious flaw in the parole hearing process where individuals who execute peace officers can be granted parole twice in under two years."